There are, of course, numerous trajectories along which U.S.-China relations might evolve if China aims to displace the United States for global pre-eminence. Much commentary focuses on four possibilities: China either succeeds or fails, and does so with or without the occurrence of armed conflict. Given the sobering record of confrontations between leading powers and their would-be successors, many analysts hope that should Beijing surpass Washington as the predominant world power, the two countries can divine some guidance from the most prominent aberration: the peaceful shift of power from the United Kingdom to the United States in the late 19th and early 20th centuries. 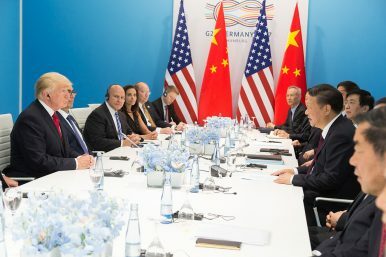 There is a sixth possibility that observers should consider: An uneasy, fluid coexistence between the United States and China — bookended by the impossibility of an alliance and the inconceivability of a confrontation — in which deep, growing tension is punctuated by occasional, begrudging cooperation. Washington has many competitive advantages over Beijing: fortunate geography, unrivaled military prowess, a favorable demographic outlook, dynamic ecosystems of higher education and technological innovation, and growing energy self-sufficiency. Washington also occupies the central role in a postwar order that, while under growing duress, remains a central organizing framework in world affairs. Unfortunately, the past two years have compounded national-level political dysfunction within the United States and created the impression among longstanding allies that it is an unstable, even erratic, actor abroad. They are unsure whether the present nature of U.S. engagement abroad, with its skepticism of international institutions and its preference for bilateral transactionalism, marks an aberration from traditional U.S. foreign policy or signifies its new course. That uncertainty may curtail Washington’s ability to mobilize collective action on pressing global challenges. China would seem poised to fill the void. Its economy has grown from less than 2 percent of gross world product in 1978 to over 15 percent today and is on track to overtake the United States in overall size well before the middle of the century. The world’s largest exporter and trading country, China generates roughly one-third of global growth. Its military has modernized to the point that, “[b]y 2035, if not before, China will likely be able to contest U.S. operations throughout the entire Indo-Pacific region,” concludes the U.S.-China Economic and Security Review Commission. And Beijing’s strides in domains from autonomous vehicles to quantum computing affirm its increasing capacity for indigenous innovation. But China also has many competitive liabilities. It is bordered by 14 countries, many of which are highly unstable. RAND Corporation defense researcher Timothy Heath notes that the People’s Liberation Army’s ability to project military power is constrained by “the legacy of an obsolete command system, rampant corruption, and training of debatable realism.” Its demographic prognosis is bleak. It has few, if any, genuine allies, and its approach to domestic governance has limited global appeal. The past year suggests that China will confront additional challenges as its revival proceeds. Its continued militarization of the South China Sea is compelling members of “the Quad” — Australia, India, Japan, and the United States — to intensify defense cooperation with one another. Its signature geoeconomic project, the Belt and Road, is encountering growing backlash abroad, and an increasing number of observers question its fiscal sustainability. China’s intensifying surveillance of its citizens and its mass internment of Uyghurs are receiving widespread attention. And its technological progression is eliciting heightened scrutiny; last July, the intelligence chiefs of the “Five Eyes” countries agreed to try to constrict the growth of telecommunications giant Huawei. Perhaps most critically, though, China has evinced little desire to replace the United States in its present capacity. While increasingly global in scope, Beijing’s foreign policy remains parochial in objectives, aimed more at sustaining its growth and cementing its centrality within the Asia-Pacific than at furnishing global public goods. The economist Charles Kindleberger observed in 1973 that the Great Depression persisted “because the international economic system was rendered unstable by British inability and United States unwillingness to assume responsibility for stabilizing it.” We may witness a variant of this dynamic nine decades on, with neither the lone superpower nor its putative replacement able or willing to invest in the current order’s modernization. Should that dynamic indeed prevail, China might continue to chip away at America’s margin of pre-eminence without actually ascending to the commanding heights of geopolitics. Frustrated by U.S. unpredictability, apprehensive about China’s ambitions, and unwilling to resign themselves to strategic gridlock between the two, “middle” countries may play an important role in adapting the global order to contemporary realities.